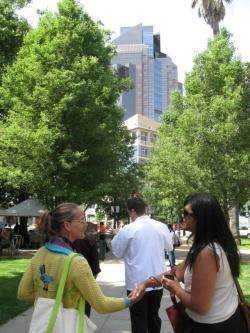 May 2 marked the return of Wednesday certified farmers markets and &apos;Follow the Chef&apos; tours to downtown Sacramento, namely Cesar Chavez Plaza, the park that faces Grange and The Citizen Hotel. Since Chef Oliver only unpacked his knives and settled into Grange in November, he introduced himself in a casual California way that betrayed his Sussex [read: British] accent. 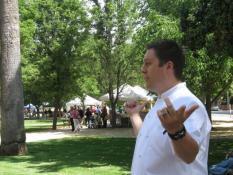 However he restrained his gestures (arms) as he described how much he loves the restaurant&apos;s proximity to the growers. Trust your chef when he tells you that he and executive sous chef, Brad Cecchi, were there much earlier. The early bird catches the worm! 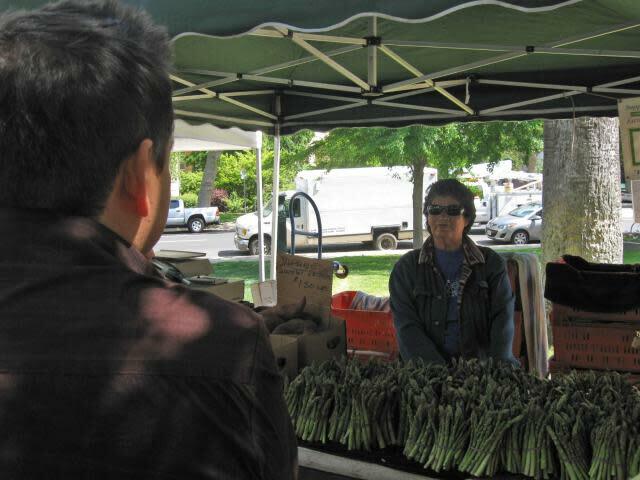 As we casually walked between booths, Chef Oliver entertained questions about seasonal crops, cooking and pairing foods, and his personal relationships with local farmers. (Some growers won&apos;t even sell you certain harvests because they&apos;ve set them aside for specific chefs!) As we stopped at certain canopies, we were given helpful pointers: how to spot fresh asparagus, how to cook fava beans [or broad beans] and how to encourage children to eat healthy foods. Who knew dried apples and marshmallows are so similar?! Despite the dry winter in Sacramento, Chef Oliver notes &apos;pockets of abundance&apos; in the region keep his creative menus thriving. The tour also highlights the people who bring such fresh ingredients to market. All that charisma is definitely missing from the supermarket aisle. Near the corner of 10th & I streets, Beatriz typically brings the best melons and squash. Closer to 9th & I streets, Ryan of Bogdanich Farms features naturally sweet snacks from dried fruits to jams that pair well with goat cheese -- or grilled steaks. He knows his regulars, but is ready to help anybody entertain hungry guests. My favorite was Dr. Charles French, who retired from family medicine in East Sacramento to produce Tehama Blend Olive Oil. No special orders needed from your primary care physician to see this heart health specialist! Good thing we received a reusable grocery bag at the outset. It helped me bring home some juicy red strawberries and green sugar snap peas. I&apos;m imagining salad and grilled chicken paired with a viognier. As the tour continued, I had the pleasure of meeting various Sacramento community members and visitors: from a food literacy advocate to a women&apos;s online magazine editor, from a California legislative lobbyist to a Illinois resident on vacation. We knew the tour had ended when Natalie oh so tactfully asked, &apos;When do we get to eat?&apos; That was kind of her to mask the growling sounds from my tummy! Part 2 of our farm-to-fork adventure was waiting for us back at the restaurant... Ready for the conclusion of our Park-to-Plate narrative? Are you meeting planner who&apos;s already picturing &apos;Follow the Chef&apos; as a team building activity, incentive, or networking event for your conference? Contact the Sacramento Convention & Visitors Bureau to ask us how to make the most of your downtown Sacramento dining partners.